Would you like more information about ESAs or other tax-advantaged ways to fund your child’s — or grandchild’s — education expenses? Contact us in Brea (714.990.1040) or Visalia (559.732.4135) for assistance. One contract every business owner needs to sign that sometimes goes overlooked: a buy-sell agreement. A “buy-sell,” as it’s often called for short, is a contract set forth by the owner or owners of a business that describes how ownership changes will take place. Like a good insurance policy, one of these arrangements will help protect you and other owners in difficult times. 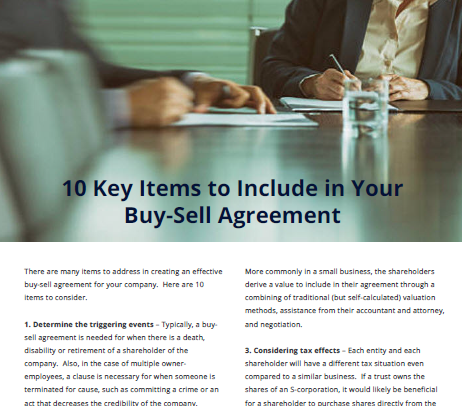 Download our 10 Key Items to Include in Your Buy-Sell Agreement for 10 key items to consider. Need further information or assistance? Contact us in Brea (714.990.1040) or Visalia (559.732.4135).